The newest release of PEAKS AB Software, version 2.0, is equipped with new tools to further improve sequencing accuracy. It also provides a more convenient and user-friendly workflow for antibody sequencing analysis with new customization capabilities. Monoclonal antibodies have a wide range of applications in biochemical analyses, medical research, diagnostics and therapeutics. The protein sequence of an antibody (Ab) encodes critical information for its structure and function. When cDNA or the hybridoma cell line is not available, de novo protein sequencing of an antibody can help. PEAKS AB Software is a platform for de novo antibody sequencing and the characterization of modifications and sequence variants by using liquid chromatography coupled to tandem mass spectrometry (LC-MS/MS). PEAKS AB software also supports characterization of post-translational modifications (PTMs) and variants for research discovery and quality control purposes. Antibody protein sequences were obtained from the antibody de novo peptide sequences. The confident de novo sequence tags, which have direct fragment ion proof, were assembled into antibody sequences. 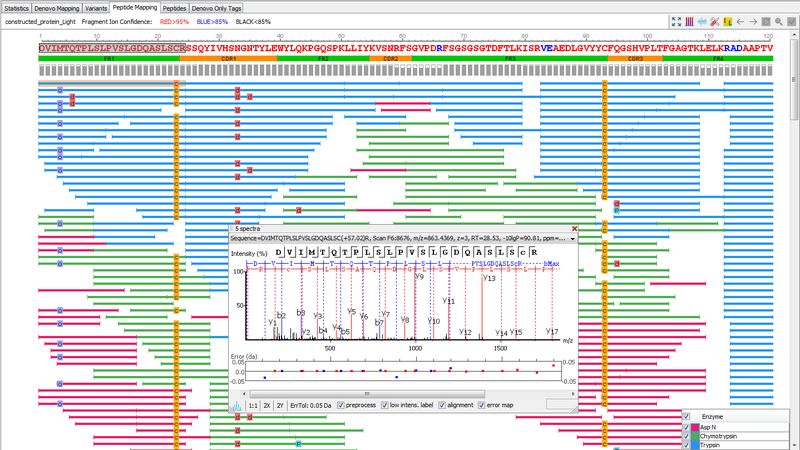 The de novo View shows the map of de novo peptide sequence tags. For each sequence position with modifications, the modified and native peptide forms, along with their chromatrogram are listed for quantitative viewing. 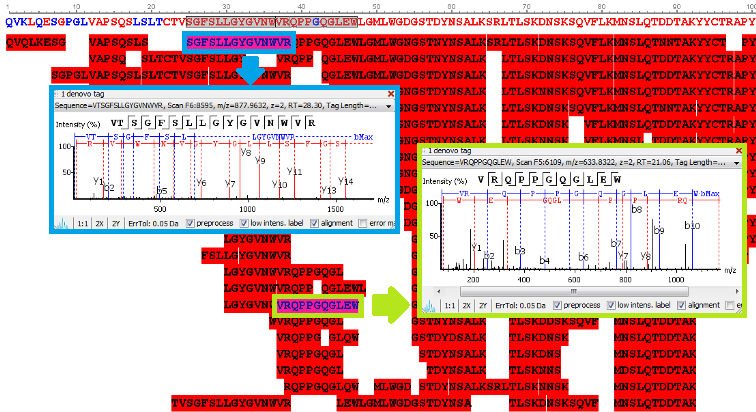 Sequence Variant View highlights amino acid substitutions and/or truncations which may result from erroneous transcription of complementary DNA. 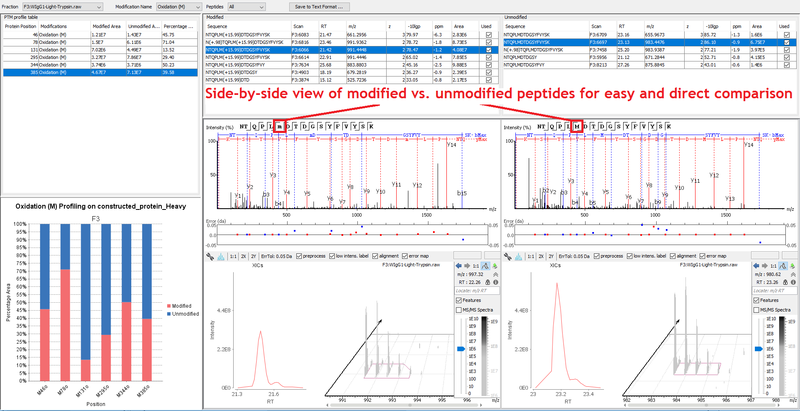 With the enhanced “Peptide Mapping” function, PEAKS AB Software can compare annotated chromatograms between different samples. Possible sequence variants will be illustrated to facilitate the product quality control or any other related antibody studies. 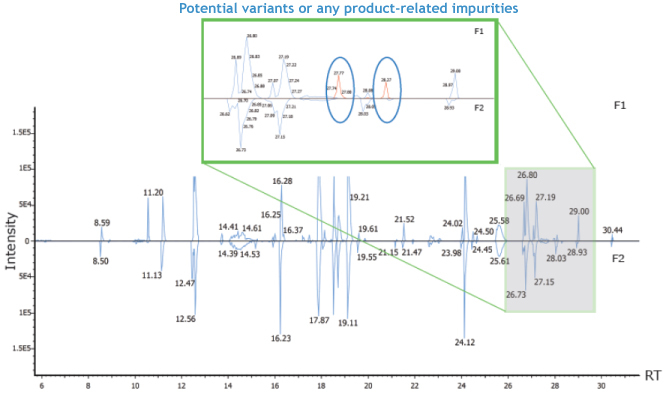 As shown in the image to the right, blue peaks in the annotated chromatogram denote the signals that can be mapped to peptides from reference proteins, and the red peaks denote sequence variants or any product-related impurities. PEAKS AB software directly sequences the antibody protein using high resolution LC-MS/MS data sets from orthogonal enzyme digests. It performs de novo peptide sequencing first, and assembles the confident sequence tags into antibody sequences. Shan, B. and Xin, L. Integrating de novo Sequencing and Database Search for Monoclonal Antibody Sequencing. J Biomol Tech. 24(Suppl). S62–S63. 1/5/2013. Tran, N.H. et al. Complete De Novo Assembly of Monoclonal Antibody Sequences. Scientific Reports. 6:31730. 26/08/2016.